This may be a situation that you’ve never been in before. You’ve been injured on the job, you are hurt, and you don’t know what to expect in the days and weeks following the accident. It is important to know both what is expected of you, and what you can expect from your employer and your employer’s insurance company, so that you can be prepared to protect your rights and your worker’s compensation benefits. Report the injury. Your injury should be promptly reported to someone in a position of authority, such as a supervisor or your employer’s human resources department. Submit to a drug test on the day of your accident. It is important that you don’t take drugs or drink alcohol before work because it could be grounds to deny your workers’ compensation claim. Refusing to submit to a drug test will also result in your claim being denied. Provide an accurate medical history to your doctor. Do not lie. Your medical records are very important to your recovery and any discrepancy could significantly impact your workers’ compensation claim. Being dishonest will hurt you more than a previous injury or an underlying medical condition. Provide your employer with a doctor’s note regarding your work status. The note often contains work restrictions. You should ask your employer if there is work that you can do consistent with those restrictions. Try working if your employer offers you work that you can do according to your doctor’s note. 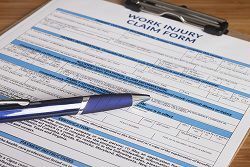 If your employer offers you light duty work within your doctor’s restrictions shortly after your accident, it is usually advisable that you try the job. However, if you have any question about whether you should return to work, you should immediately consult an experienced workers’ compensation attorney, in order to avoid making a decision that could negatively affect your claim. If you do try the job, and are unable to do it because of your injury, then go back to your doctor and explain exactly why you are having trouble, and ask that your restrictions be modified to reflect your current capabilities. Be honest when your employer’s insurance company contacts you for a statement. The insurance representative may ask for a history of other workers’ compensation claims, which you should provide. The insurance company cannot deny your claim because of a prior work injury, but your claim may be denied if you are dishonest. If you have any questions about what you should do, then it is important to speak to a lawyer before taking any action. A lawyer can explain your legal rights and responsibilities and help you prevent problems with your workers’ compensation claim. Your employer will provide you with a list of healthcare providers. You have the right to choose a doctor to treat you from this list. You will be provided with all of the medical treatment that you need to recover from your workplace accident injury. Treatment may include doctor’s visits, medication, physical therapy, testing such as x-rays and MRIs, injections, and even surgery. It is important to advocate for yourself and to ask questions of your doctor if you have concerns about your medical treatment or prognosis. Your employer will try to get you back to work as soon as possible. However, you should not be pressured to go back to work before you have medical clearance to do so. Again, if you have any question about whether you should go back to work, you should get advice from a lawyer to be certain that you are making the right decision. While you may have a nice working relationship with your employer, it is important to remember that your employer’s interests are often at odds with your interests after a workplace accident. You are going to be expected to return to work as soon as you are physically able to do so. Sometimes, however, your injuries will be too significant for you to go back to your previous job. In many cases, instead of returning to work for your employer, you, your employer, and their insurance company may enter into a settlement of your claim. A settlement should take into account your expected entitlement to future income benefits and medical treatment. The insurance company will try to keep this settlement as low as possible. Once you reach a settlement, it will be binding and it will prevent you from pursuing further damages. Therefore, it is important that you don’t try to negotiate a settlement on your own. Instead, you should hire an attorney with experience valuing workers’ compensation cases, who will be able to get the insurance company to provide you with a fair settlement. If you are being pressured to go back to work too soon, unable to work at all, or asked to return to a light duty job, then it is important to consult with an attorney. It will be much harder for your employer to get you to go back to work and to take away your benefits once you have a lawyer on your side. An attorney can initiate your workers’ compensation claim and request a hearing if your employer and your employer’s insurance company are not providing you with all of the benefits to which you are legally entitled. Both you and your employer have the right to engage in discovery to find out more about the other party’s position. Your claim may then be settled or it may go to a hearing with an administrative law judge. An attorney can help you protect your rights and your potential recovery during each step of the process. To learn more, please start a live chat with us today and schedule your own free, no-obligation consultation today. Can I Choose My Own Doctor for a Workers’ Comp Claim? How Long Can I Get Workers’ Comp Benefits?